If you’re looking for a kitchen upgrade on a budget, take a look at your backsplash. It’s easy to turn this unassuming strip of wall between your counters and upper cabinets into a design feature that will transform your whole kitchen. “If you’re looking for a kitchen upgrade on a budget, take a look at your backsplash. It’s easy to turn this unassuming strip of wall between your counters and upper cabinets into a design feature that will transform your whole kitchen. 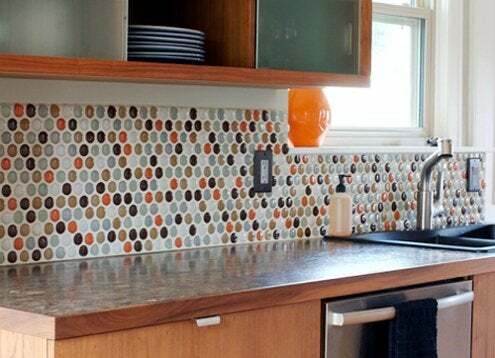 Tile is a great choice for backsplashes, and easy to do yourself if you’re willing to rent a tile saw for the weekend. Tile runs between two and twenty bucks a square foot. Because it’s a relatively small area, you can accent a backsplash with handmade tile, stone, marble, glass, or anything else you really like without breaking the bank. There are mesh tile adhesive systems on the market now that take a lot of the mess out of installing tile once you get the hang of using them. You’ll still need to grout the tile, of course, so be sure to choose a grout color that’s complementary to the rest of your kitchen and easy to keep clean. Depending on what was there before, the hardest part about installing a tile backsplash could be getting the substrate, or the wall underneath, perfectly flat. If that’s a tall order, you might consider embossed metal ceiling panels instead to cover any irregularities.